A Festival Workshop in the Art of accompanying the Anglican Service. Coach accompaniments with Dr. Rose to be offered in a Festival Concert on Saturday afternoon under his direction with the Festival Choir. 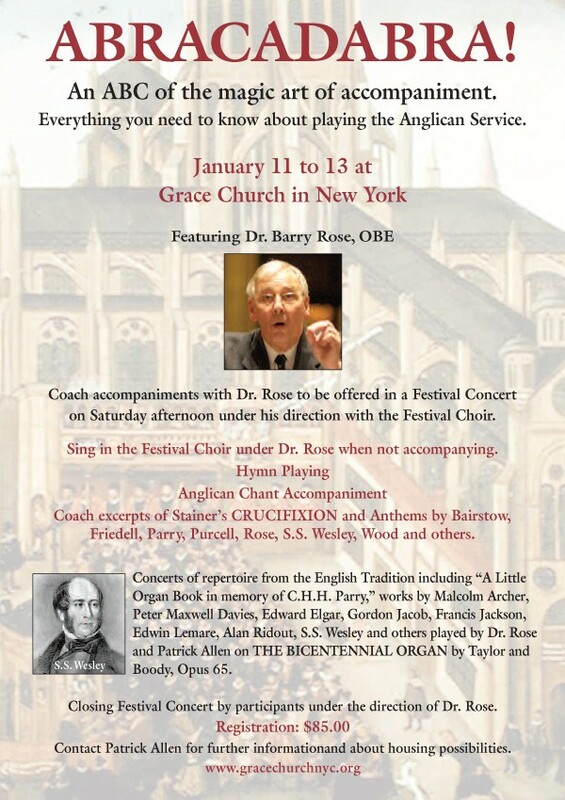 Sing in the Festival Choir under Dr. Rose when not accompanying. Concerts of repertoire from the English Tradition including “A Little Organ Book in memory of C.H.H. Parry,” works by Malcolm Archer, Chuckerbutty, Peter Maxwell Davies, Edward Elgar, Donald Hunt, Edwin Lemare, Philip Moore, Alan Ridout, S.S. Wesley and others played by Dr. Rose and Patrick Allen on THE BICENTENNIAL ORGAN by Taylor and Boody, Opus 65. Closing Festival Concert by participants under the direction of Dr. Rose. Contact Patrick Allen for further information and about housing possibilities.